As all the world economies writhe in financial pain from the cleansing of the largest bubble in financial history, the same question is being asked — how could this happen? Of course the usual answers are trotted out — human greed, animal spirits, criminal fraud, or capitalism itself. Modern financial history has been a series of booms and busts that seem to blend together making one almost indistinguishable from the next. The booms seduce even the most conservative into taking what in retrospect appear to be outlandish risks speculating on investment vehicles they know nothing about. In response to the financial meltdown, central banks are slashing interest rates to nearly zero and growing their balance sheets exponentially. With no more room to lower rates, central bankers now speak of a "quantitative easing" policy which in plain English means "creating money out of nowhere." But no one is shocked or horrified by this government counterfeiting. All this, after the US central bank (the Federal Reserve) has already, at this writing, increased the M2 money supply by 11 times since August of 1971 when the US dollar's last faint ties to gold were severed. While history clearly shows that it is this very government meddling in monetary affairs that leads to financial market booms and the inevitable busts that follow, mainstream economists either deny that financial bubbles can occur or that the "animal spirits" of market participants are to blame. Economists running central banks even claim that it is impossible to identify asset bubbles. Meanwhile, the Austrian school stands alone in pointing the finger at government intervention in monetary affairs as the culprit. Austrian economists Ludwig von Mises and Friedrich A. Hayek's Austrian business-cycle theory provides the framework to explain speculative bubbles. The Austrian theory points out that it is government's increasing the supply of money that serves to lower interest rates below the natural rate or the rate that would be set by the collective time preferences of savers in the market. Entrepreneurs react to these lower interest rates by investing in "higher order" goods in the production chain, as opposed to consumer goods. Despite these actions by government, consumer time preferences remain the same. There is no real increase in the demand for higher order goods and instead of capital flowing into what the unfettered market would dictate — it flows into malinvestment. The greater the monetary expansion, in terms of both time and enormity, the longer the boom will be sustained. But eventually there must be a recession or depression to liquidate not only inefficient and unprofitable businesses, but malinvestments in speculation — whether it is stocks, bonds, real estate, art, or tulip bulbs. This book was my master's thesis (with just a couple slight changes and additions) written under the direction of Murray Rothbard and examines three of the most famous boom and bust episodes in history. Government monetary intervention, although different in each case, engendered each: Tulipmania, the Mississippi Bubble, and the South Sea Bubble. As the 17th century began, the Dutch were the driving force behind European commerce. Amsterdam was the center of this trade and it was in this vibrant economic atmosphere that tulipmania began in 1634 and climaxed in February 1637. At the height of tulipmania, single tulip bulbs were bid to extraordinary amounts with the Witte Croonen tulip bulb rising in price 26 times in a month's time. But when the market crashed: "[s]ubstantial merchants were reduced almost to beggary," wrote Charles Mackay, "and many a representative of a noble line saw the fortunes of his house ruined beyond redemption." What made this episode unique was that the government policy did not expand the supply of money through fractional reserve banking which is the modern tool. Actually, it was quite the opposite. The Dutch provided a sound money policy that called for money to be backed one hundred percent by specie, which attracted coin and bullion from throughout the world. Free coinage laws then generated more money from this increased supply of coin and bullion than what the market demanded. This acute increase in the supply of money fostered an atmosphere that was ripe for speculation and malinvestment, manifesting itself in the intense trading of tulips. The Bank of Amsterdam, which was at the center of tulipmania, was an inspiration for one of history's most notorious currency cranks — John Law. Gifted in math, Law learned the banking business from his father in Scotland. But after his father died, the young Law had more interest in games of chance and women. During the day he would write pamphlets on money and trade while enjoying the social life at night. Law made various proposals to governments around Europe for what we would call today a central bank and was turned down until 1716 when one of Law's partying friends, the Duke of Orléans, assumed control of the French government after Louis XIV died. The French government was on the verge of bankruptcy, and its citizens were fed up with their government's currency depreciation, recoinage schemes, and increased tax collections. The situation was ripe for Law's monetary magic. Law sought to "lighten the burden of the King and the State in lowering the rate of interest" on France's war debts and to increase the supply of money to stimulate the French economy, with the opening of General Bank, owned 25 percent by Law and 75 percent by the King, and the formation of a series of companies that when ultimately merged together were known as the Mississippi Company. Two years into his system, the regent granted Law's request that the General Bank be made part of the state, becoming the Royal Bank, patterned after the Bank of England. With the Royal Bank creating vast amounts of paper currency, Mississippi Company share prices took off which led Law to issue more shares, using the capital to refinance more of the government's debt. Ultimately, the scheme unraveled, despite Law demonetizing gold and silver so that only royal banknotes and Mississippi Company shares would circulate as money. An outraged French public ultimately forced the regent to place the once-revered Law under house arrest. While John Law was struggling to keep his Mississippi bubble inflated, across the English Channel, a nearly bankrupt British government looked on with envy, believing that Law was working a financial miracle. It was anything but, however Sir John Blunt followed Law's example with his South Sea Company, which in exchange for being granted monopoly rights to trade with South America, agreed to refinance the government's debt. As the price of South Sea Company shares rose, as in the case of Law's system, more shares were sold and more government debt refinanced. The company had no real assets, but that didn't matter as speculators bid the share price higher and higher, spawning the creation of dozens of other "bubble companies." The South Sea Company lobbied the British government to pass a Bubble Act that would shut down these new companies that were competing for investor capital. Ironically, it was the enforcement of that act that burst the bubble with South Sea Company shares falling nearly 90 percent in price. Beloved British statesman Sir Robert Walpole reorganized the technically bankrupt South Sea Company, and it remained in business for years. Although these episodes occurred centuries ago, readers will find the events eerily similar to today's bubbles and busts: low interest rates, easy credit terms, widespread public participation, bankrupt governments, price inflation, frantic attempts by government to keep the booms going, and government bailouts of companies after the crash. Although we don't know what the next asset bubble will be, we can only be certain that the incessant creation of fiat money by government central banks will serve to engender more speculative booms to lure investors into financial ruin. 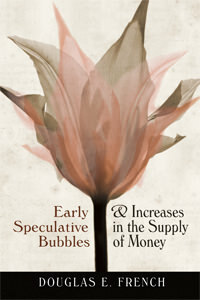 This article is the introduction to Doug French's new book Early Speculative Bubbles and Increases in the Supply of Money.